China Mobile, the world's largest telecommunications firms in terms of subscribers, said Wednesday that it expects to construct its 4G networks in over 340 cities to reach a total of more than 500,000 TD-LTE base stations by the end of next year. 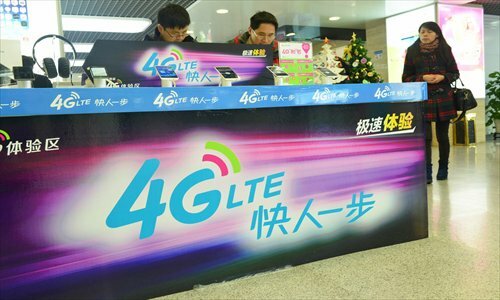 In the upcoming 2014, besides enlarging the 4G network coverage, the company also plans to sell more than 100 million TD-LTE-compatible devices to end-users and pledges subsidies of over 27 billion yuan ($4.45 billion) to makers of TD-LTE smartphone, China Mobile's chairman Xi Guohua said Wednesday during the 2013 China Mobile Worldwide Partner Conference held in Guangzhou, South China's Guangdong Province, between Tuesday and Thursday. Although telecom carriers in many other countries and regions still hold a wait-and-see attitude toward TD-LTE, Xi expressed strong confidence in this homegrown standard, saying that in partnership with more than 1 million enterprises, the company can speed up the popularization of TD-LTE networks. Its partners including smartphone makers - such as Lenovo, Samsung and Xiaomi - as well as retailers and online platforms like Tmall and Suning, said the company. In early media reports, TD-LTE-compatible iPhone 5s is also expected to come out at the conference, but no official information like that has been disclosed yet. China Mobile said it is still in talks with Apple Inc to sell iPhones, Reuters reported on Wednesday. The company has been actively promoting a 4G service through its 10086 hotline, official website and microblog account on Sina Weibo, China's Twitter-like service, since it was granted the 4G license by the Ministry of Industry and Information Technology in early December. China Mobile's two smaller rivals, China Telecom and China Unicom, have not shown too many intentions of making extensive use of TD-LTE, with a preference instead for waiting for the granting of FDD-LTE, an alternative 4G standard more widely deployed in international markets. Given that the ministry gave no clear clue on when it will offer FDD-LTE licenses, China Mobile gained an advantageous leg up over its rivals in offering 4G services. According to media reports, China Mobile expects to win back the market share that it has lost to its two smaller rivals during the 3G era through its 4G service.